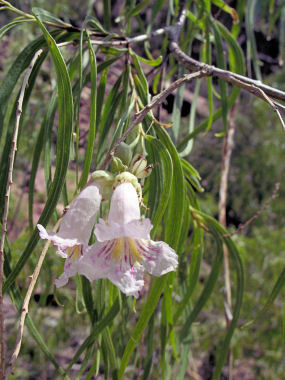 Desert Willow is a member of the Bignonia Family. It appears as a large shrub or small tree with dark brown, scaly or ridged bark and a trunk to 1 foot in diameter. The plant grows to 25 feet in height and has light green, narrow leaves to 6 inches in length and 3/8 inches in width. The plant grows in washes and near water in desert grasslands, foothills and mesas at elevations between 1500 - 5000 feet. Desert Willow helps to control erosion by forming dense thickets along washes. Desert Willow blooms between April - August and produces whitish, tubular flowers with a pink or yellow tinge to 1.5 inches in length.